I can't believe it's that time of year already. It seems like it was just yesterday when I was working in my garden. Now the ground is covered in snow, the temperatures are below freezing, and Christmas is just a few weeks away. Has everyone got all their Christmas shopping done? I did almost all my shopping on-line on Cyber Monday this year. I got so many deals. I don't think I'll ever shop Black Friday again! Although I did find the entire experience so frustrating. I literally was on the computer all day long, and boy did I have a splitting headache when I was done! Anyway, because it's that time of year, I wanted to show some posts in the next few weeks of holiday outfit ideas. I don't know about you, but I see so many holiday outfits that are completely impractical for both my lifestyle and my climate. It seems there are so many spaghetti strap dresses and strappy heels advertised for the holidays. It's way too cold and snowy in Wisconsin for those type of outfits, so I wanted to create a holiday outfit "Wisconsin Style". 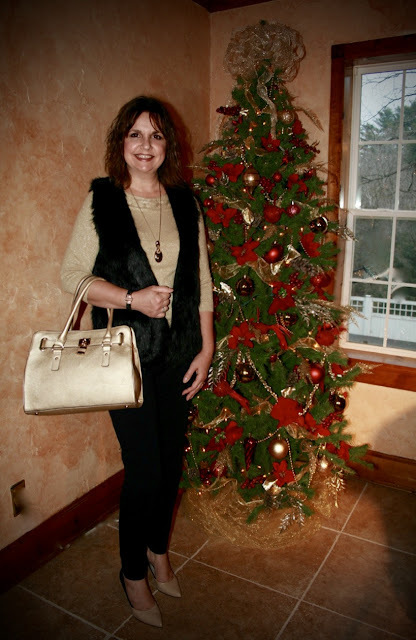 I decided to wear a metallic gold sweater to bring on the holiday glitz, then I added a lux black fur vest to keep warm and also add even more glitz and glamour. My bottoms are ponte knit pants, which keep me super warm and comfy. I added more glitz and glamour to my outfit by wearing black and gold jewelry and carrying a metallic gold handbag. The handbag is the only thing new in this outfit. It was a gift from my daughter for my birthday. It's from Charming Charlie. Now I am wearing heels in this outfit, but if ice and snow are a problem for you, the heels could easily be switched out to ankle boots. Or, you could do what I often do: wear winter boots outdoors, and switch the shoes out to heels once inside. I bought this sweater last year from JCP and showed it to you in THIS POST. It is a beautiful metallic gold and has this lovely neckline. It's the perfect holiday sweater! The fur vest I also picked up last year at JCP for only $12.00. I know, what a steal eh? It's so warm! I've worn it numerous times and showed it to you before HERE . The argument of wearing leggings as pants never seems to end. I think I just decided to throw in the towel on this issue because everyone continues to wear leggings as pants no matter how many bloggers speak out against it. These are ponte knit leggings which are actually described as 'pants'. They are super thick, so I have no problem wearing shorter tops with them. I bought them from JCP last year, but they are still available. Worthington Ponte Leggings - JCPenney: HERE, Metallic Gold Sweater (no longer available) similar HERE, Metallic Gold Handbag (no longer available) similar HERE, Black Fur Vest (no longer available) similar HERE, Black/Beige Pump (no longer available) similar HERE and HERE. I hope to bring you more Holiday Outfit Ideas in the weeks to come. I even created a Holiday Fashion Board on Pinterest HERE featuring all my favorite Holiday Outfits I've seen so far in Blog Land. I love that you're realistic in your style, Amy!! I'm always way too cold to wear strapless and sleeveless at this time of year---unless we're in Hawaii!! Thanks Jodie! Realism is my middle name when it comes to fashion! It's definitely too cold for spaghetti straps and heeled sandals! Love your gold sweater and fur vest paired together! This is such a chic holiday look! Thanks Jill...and it's only gonna get colder with the polar vortex coming next week! What a great look for the Holidays! Love how well everything in your outfit coordinates! I purchased the same sweater last year thanks to your blog post :-) It's perfect! And it looks great styled with the fur vest! Thanks Elli! That's great that you were able to find the same sweater. I saw another holiday sweater I bought last year in the store again this year. They are such classic holiday sweaters, they'll last for many years to come. I love the metallic and fur together, and they make a perfect holiday look! Glam and warm!! This outfit is so chic and sophisticated as well as festive. Black and gold are lovely combination. I like how your new bag "carries" the theme! I look forward to seeing your other holiday looks for winter locations! gold and black is a lovely and classic combination for the holidays. you look fabulous. thank you for adding your post to my Fine-Whatever link up. Thank you. I hope you find one. They are fun, and very warm! I love the gold and black of this look! Your sweater is so pretty! I am so behind on Christmas shopping! Thanks Sarah! Good luck on your Christmas Shopping. Love the gold and black and the fur vest is the perfect compliment. Beautiful tree!